i love your sunset! so dreamy! This sentiment is beautiful as is your art work! Wow - gorgeous! I love the addition of the stitching. Thanks for the inspiration! Adding floss stitching along the tops of the mountains is so cool and your card is stunning! For purple mountains majesty...this is so pretty--I love your colors! Love the colors and the stitching detail! Beautiful card! Love the stitching you did here. Beautiful card! Wow! I love everything about this card! Fabulous card! Gorgeous colors and amazing texture and interest from the stitching. Lovely!! Your hand stitching is perfect for a bit of texture and interest! Your card is stunning. I love the color choices and awesome touch with the floss. This looks like an awesome stamp set. The sentiments are so inspiring and uplifting. Very pretty colors and I like the stitching. I love all those gorgeous warm colors and the stitching adds so much! Beautiful!! I love the "desert" colors! your card is super beautiful, the colors are awesome, I love it! That's so beautiful! Love the colors and the design! Wow! Stunning landscape and colours!!! Beautiful card!!! Such a wonderful color combination. Thanks for sharing. Beautiful sunset colors! I love the stitching on your card, as well! Those kinds of details give such a personal touch to cards. Wow !! 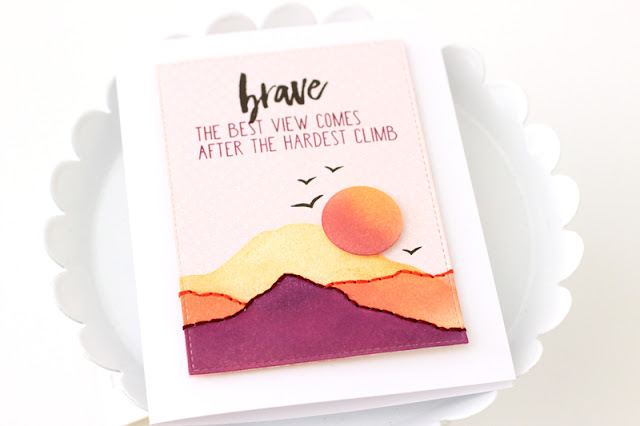 What a wonderful card design you’ve made with this set ! !